What if you could answer a 400-year-old burning question just by playing a musical instrument? You are warmly invited to join Brighton Connected Futures in celebrating the quadricentenary of one of the most important “AHA! moments” in history by launching the Kepler Concordia Research Project. We think this is worth celebrating! Please join us. If you can’t make it in person, let us know if you’d like to join us virtually. And if you can’t do that either, stay tuned for future developments and get in touch! Why the University of Brighton’s Fab Lab? Concordia PI, Kelly Snook, has built the University of Brighton’s Fab Lab to facilitate breakthroughs in creative, innovative, interdisciplinary research and education. 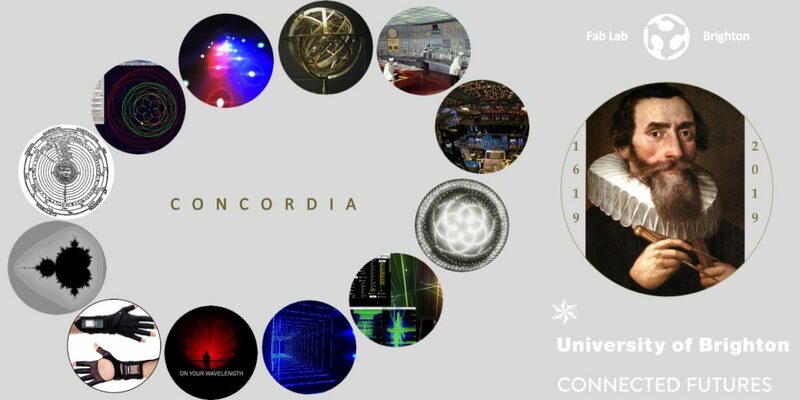 Concordia is the first and flagship research project housed within the Fab Lab, where researchers will lead the DIY hardware and immersive, interactive, audiovisual technology development for the first Concordia prototype.